Miniature: 110 x 85 mm. – On verso: 2 columns of text, around 25 lines of text. This cutting from a Missal shows the emotional moment when Christ closes his eyes in death, witnessed only by his mother and St. John. This small but intimate miniature is attributed to the prolific illuminator known as Ser Ricciardo di Nanni. The small but intimate illumination shows the poignant moment when Christ closes his eyes in death but is still heavily bleeding from his wounds. Both the Virgin and St. John strongly react with emotion and movement: the Virgin reaches out to her son, while John opens his arms ready to catch and support her. In the background, soldiers hurry away. The picture is set in a Mediterranean landscape with tall, thin trees. The predominant palette consists of a lush green for meadows and shrubs, a heavy blue for the sky and for some of the clothing, together with some old rose. In contrast, Christ’s body is left colourless, as well as the other visible body parts of those flanking him, the architectural elements and a small strip of ground below the Cross where blood seeps down in narrow streams. On the ground, horizontal, nervous dashes of green grass seem to respond to the agitated, striated clouds in the sky. These, as well as the flat circled golden haloes, are remarkable characteristics in the work of Ser Ricciardo di Nanni who was active in Florence from 1449 to 1480. Ricciardo trained with Battista di Niccolo da Padova (1449-1452). He is known to have worked with two assistants, Cosimo and Matteo with whom he illustrated numerous choir books for Florence and Fiesole. In his later work, dense colours appear. In illumination made for the Florentine cathedral (1470s), and a Psalter from the abbey of Vallombrosa, the expressive qualities of the figures diminish, while the outlines of forms are simplified and the colours grow somewhat pastier. 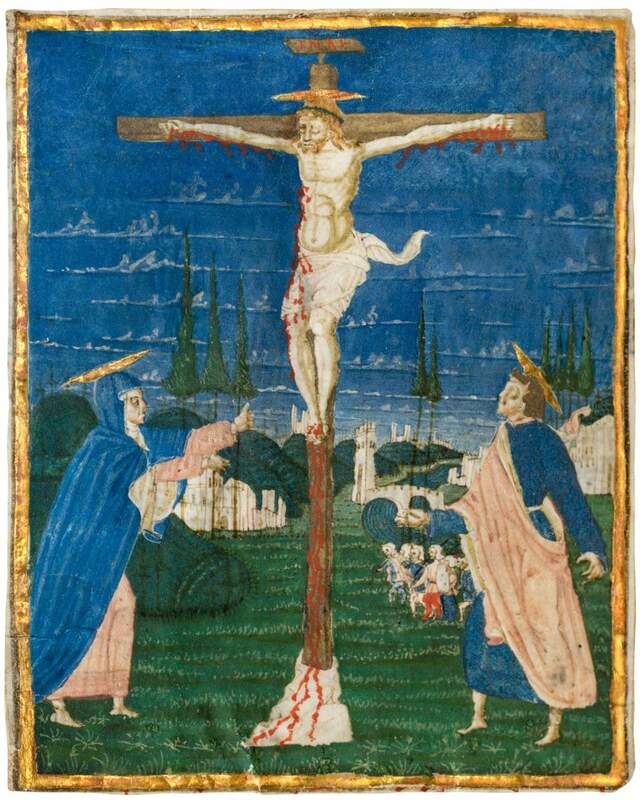 This dates the present Crucifixion likely to c. 1470s.